On busy weeknights, Oven Baked Potato Hash and Eggs is a simple and satisfying dinner that will please the entire family. The hash can be customized with a variety of McCormick spices to match your family’s taste. Go-to recipes. Everyone has them, although I would hazard a guess that if you started asking around, everyone would have a little different definition of what a go-to or standby meal means in their kitchen. For me, versatility is key. From frittatas to my oven potato hash and eggs, my family has a fondness for simple dishes that can be customized countless ways to match the mood of that particular night. I’m lucky to have a lot of cooking influences in my life. From my mom, to my grandma to my mother-in-law, I’m surrounded by knowledgeable and loving cooks who are generous with their time-learned cooking tips and recipes. A few years ago, my mother-in-law taught me how to roast potatoes in the oven using a glass baking dish. We had been chatting about roasting potatoes (which is something I’d been doing for years) and I was saying how I sometimes struggled to get a really crisp potato using a metal baking sheet. Well, she told me that she uses a glass baking dish and is always successful in getting nice, crispy, roasted potatoes. Needless to say, I tried it out the glass dish and haven’t gone back since. The glass dish is key! Every time I make this hash and eggs, I think of her. This recipe has been one of my family’s favorites for years. It’s quick, simple and satisfyingly delicious. 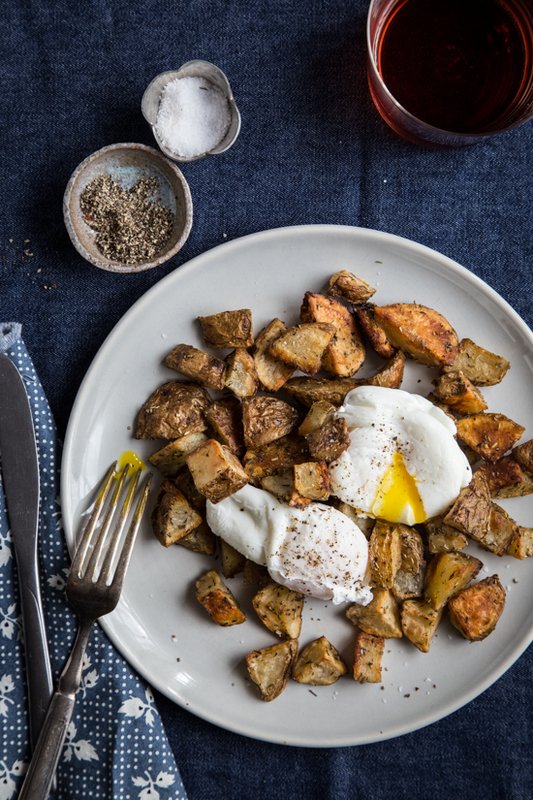 The crispy potatoes topped with perfectly poached eggs is pretty dreamy. Although anything with a runny yolk will pretty much win my heart. It’s like a built in sauce for these wonderfully seasoned potatoes. One of my favorite things about this oven potato hash and eggs recipe is that it’s endlessly versatile. 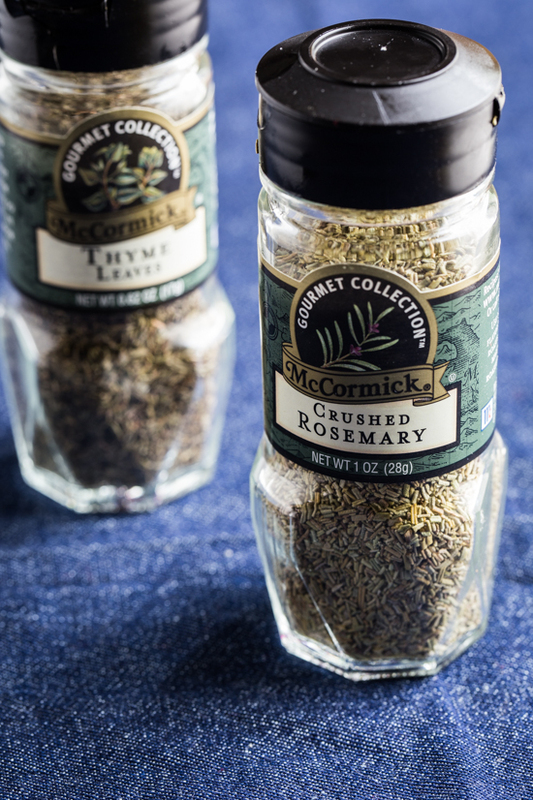 We have our favorite combinations, like rosemary and thyme, but it’s been fun to experiment with other combinations, as well. I recently made a FlavorPrint profile over on McCormick’s website in order to find recipes that are matched to my family’s favorite flavors. The process of creating the profile was pretty fun, and it felt like I was taking one of those crazy fun personality quizzes that keep me endlessly entertained. You know the ones I’m talking about. This Flavor Print quiz asked all sorts of questions about flavors and foods that I liked, and as a result got a good snapshot of the types of recipes and flavors that would fit my family. Then, it takes those results and suggests a bunch of recipes that fit your flavor profile. This tool is pretty amazing and I’ve tried several recommended recipes, all with great results. You should definitely give it a try, I think you’ll be happy with your discoveries! While you’re over on McCormick, take a minute and share one of your favorite family recipes and join the American Homemade stories. You can even peruse other family’s stories from all around the country. I was amazed at how much I related to other recipes and stories from the midwest. The whole experience has made me quite nostalgic for my childhood and even more committed to passing on my love of homemade cooking to my kiddos. Nothing quite beats a homemade meal shared around the family table, and I hope my kiddos will remember their childhood meals for years to come. Disclosure: This post is brought to you by McCormick in partnership with Kitchen Play as a part of their American Homemade Program. I was asked to share one of my family’s favorite recipes and what homemade means to us. I was compensated for this post, but all opinions expressed are, as always, 100% my own. Preheat oven to 450 degrees. Grease a glass baking dish with non-stick spray and set aside. In a large bowl, toss together potatoes, olive oil, McCormick spices, salt and pepper. Spread into an even layer in the baking dish and bake for 25-35 minutes, depending on how crispy you like your potatoes. While potatoes are roasting, bring a large pot of water to a simmer. Add vinegar and swirl water with a spoon. Drop eggs (about 2 at a time as to not crowd the pot) into the swirling water and cook until white is set and yolk is still runny. Remove egg with slotted spoon and pat with a paper towel to remove excess water. Repeat with remaining eggs. 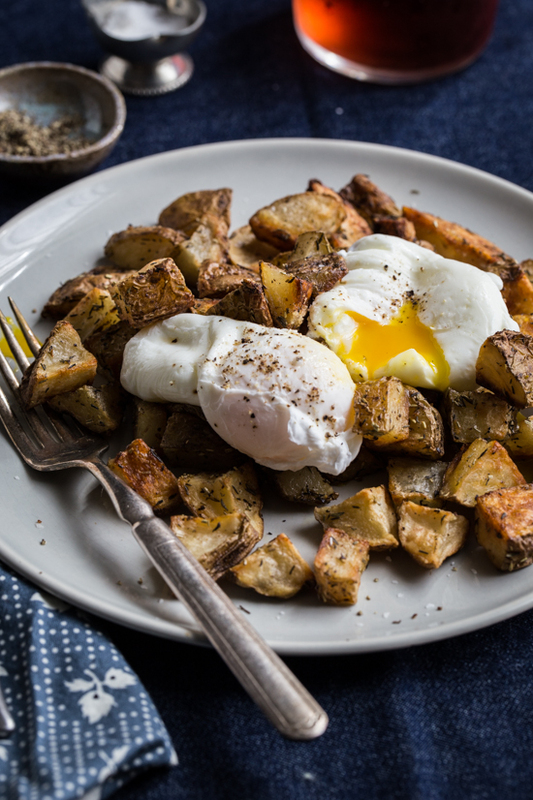 Divide roasted potatoes between four bowls or plates and top with poached eggs. Sprinkle with salt and pepper. Enjoy! Such a beautiful video! I am craving these potatoes! I just love hashes…especially with runny eggs on top! This looks fabulous! My favorite kind of potatoes EVER! Your video is a gem. I like that you baked the potatoes. I see this as breakfast in my future. Yes! The baked version allows you to walk away and do other things while dinner is in the oven 🙂 I love the idea of multi tasking!